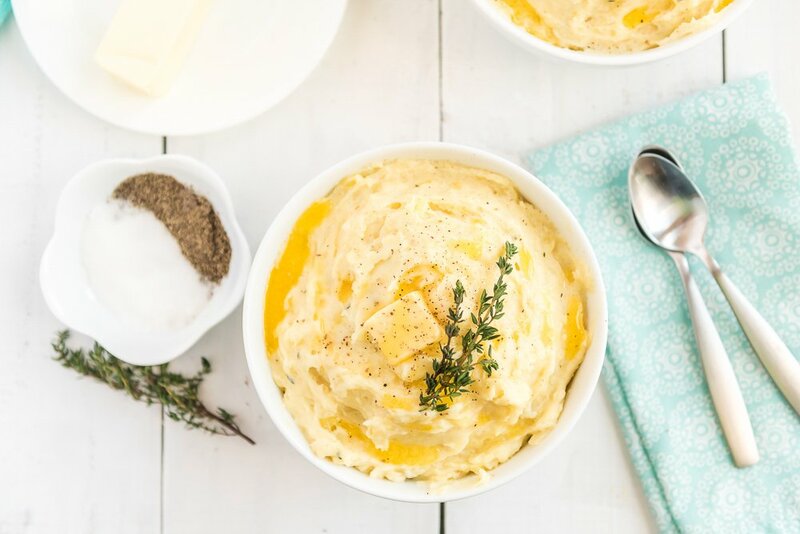 These are The Best Creamy Mashed Potatoes you’ll ever make and super easy too! They’re loaded with butter, milk, and cream and flavored with garlic and thyme and a touch of salt and pepper! 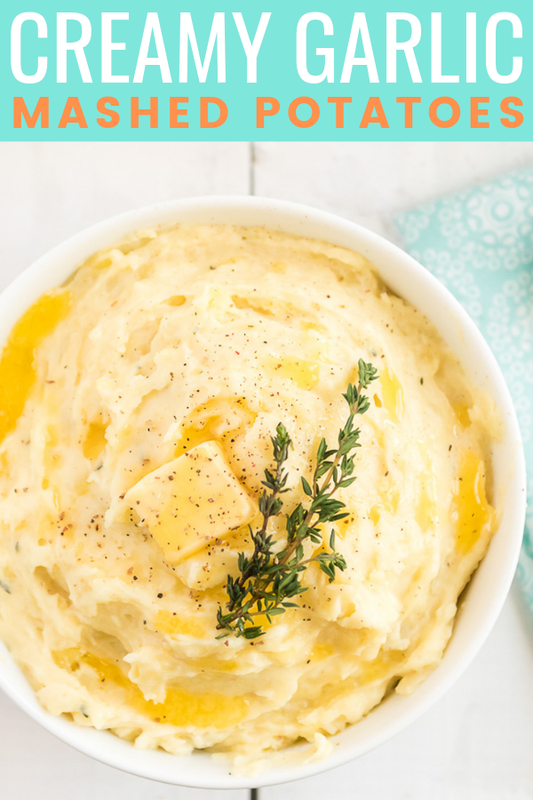 This Mashed Potatoes Recipe is an easy and flavorful side dish that’s perfect for holidays and weeknight dinners alike! Nothing beats a pillow of Creamy Mashed Potatoes topped with butter and gravy, amirite? 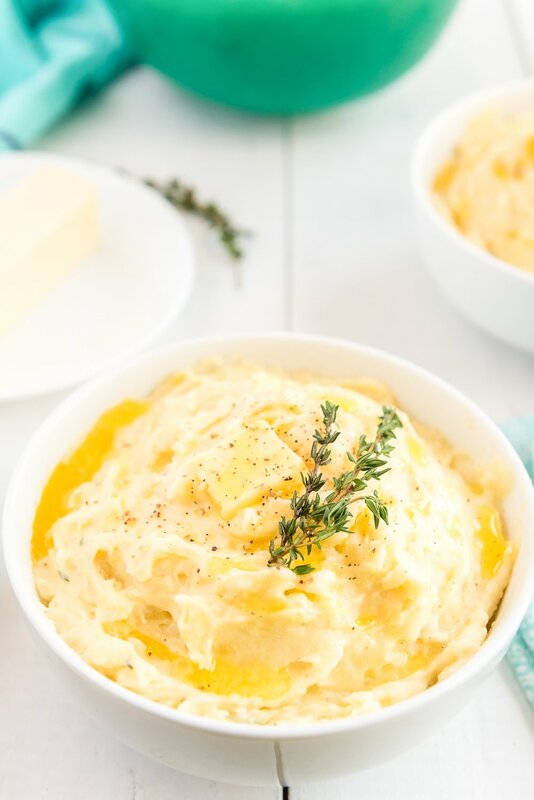 These Garlic Mashed Potatoes are incredibly creamy and are our go-to for topping shepherd’s pie or just as a side! They’re made with potatoes, garlic, thyme, cream, butter, and whole milk with a bit of salt and pepper, no cream cheese or anything like that, just simple and delicious. 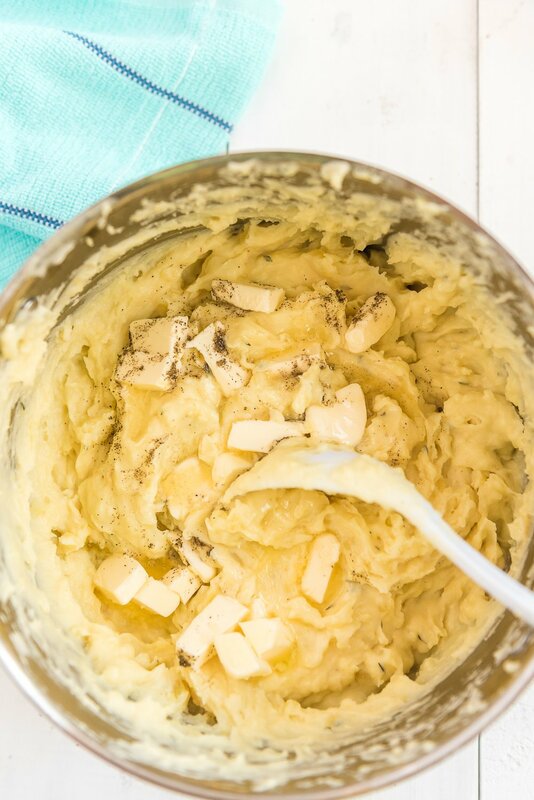 Making mashed potatoes is a very simple process and easy enough that anyone can do it! Begin by peeling and chopping the potatoes into 1-inch pieces. 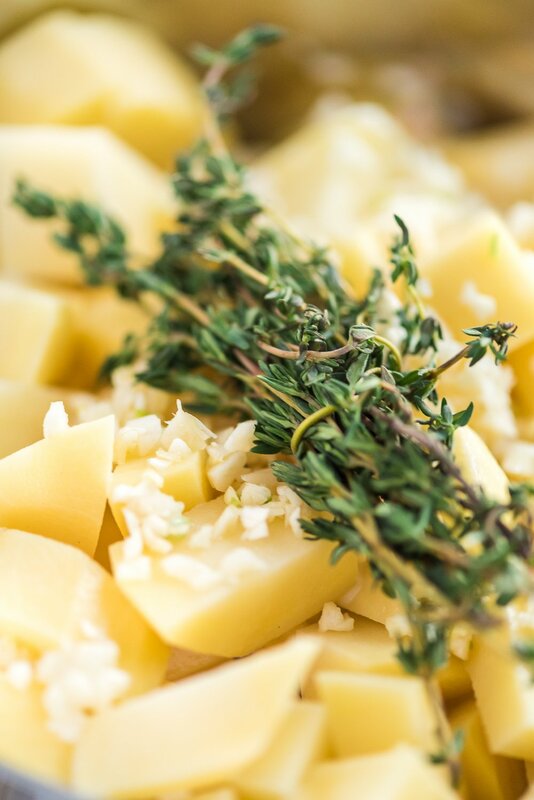 Then place the chopped potatoes in a large pot with the garlic cloves and bundle of thyme. Next, add the cream and milk and bring the mixture to a boil. Then add the salt and reduce the heat to a simmer and stir occasionally until the potatoes are fork-tender and falling apart. Remove from the heat and discard the thyme stems, use a potato masher to mash the potatoes until smooth. Add in the butter and pepper and stir just until melted and combined. Top with more butter, salt, and pepper, and fresh herbs as desired for serving. Full-fat dairy products – Don’t cut corners by using skim milk or light cream and ALWAYS use REAL butter for best flavor. 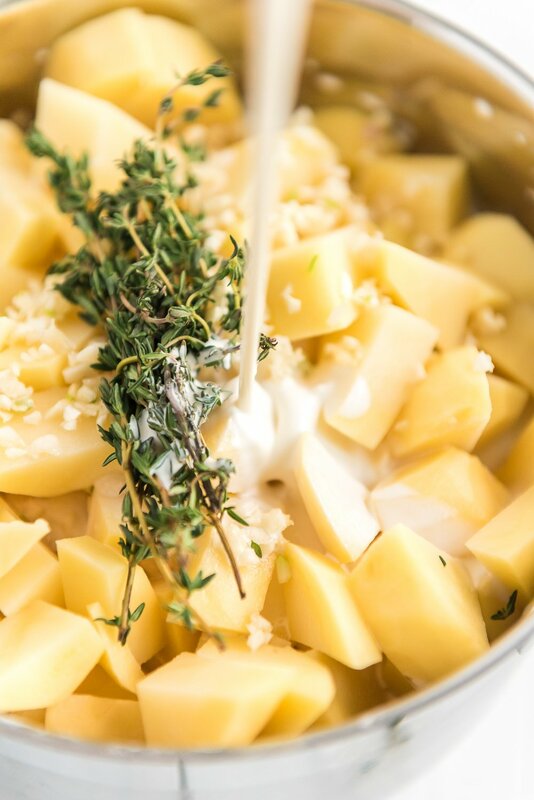 Room temperature ingredients – The cream and milk you use to cook the potatoes in doesn’t need to be room temperature, but anything added after cooking should be. This will ensure the best blend of ingredients and won’t cool the potatoes down. Do not let them cool – For the best mash, don’t let your potatoes sit for too long before mashing, hot potatoes will leave to the best texture. Cook in dairy instead of water – This recipe uses both milk and heavy cream and the potatoes are cooked right in the dairy products so there’s no need for water and no need for draining. This is what separates this recipe from most others and makes it super easy! These truly are one-pot mashed potatoes!!! Taste often – The base recipe uses unsalted butter so that you will want to taste often to adjust your salt and pepper to your taste. 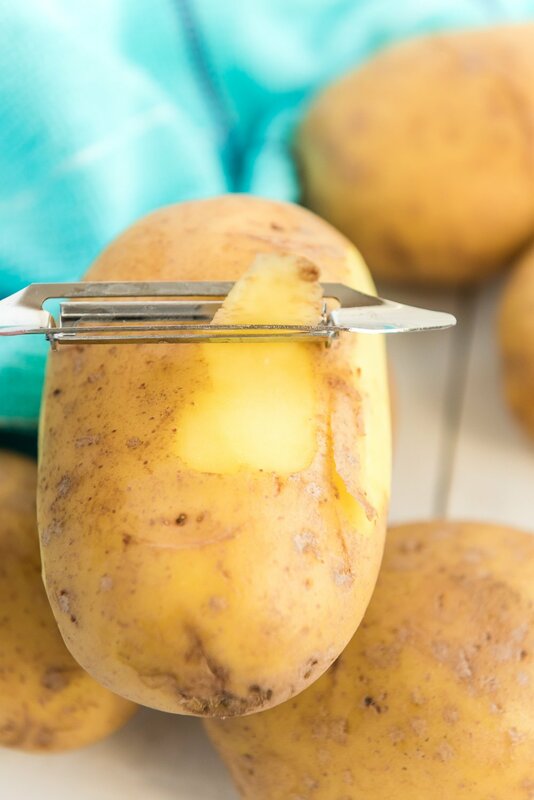 Use a potato masher – For the best consistency, use a proper potato masher to mashup your potato mixture, this will work much better than a fork. My Favorite Potato MasherBuy Now! If you only need 15 or 30 minutes to get the rest of your meal together, simply place the mashed potatoes in a large bowl and loosely cover with plastic wrap or a clean dishcloth. 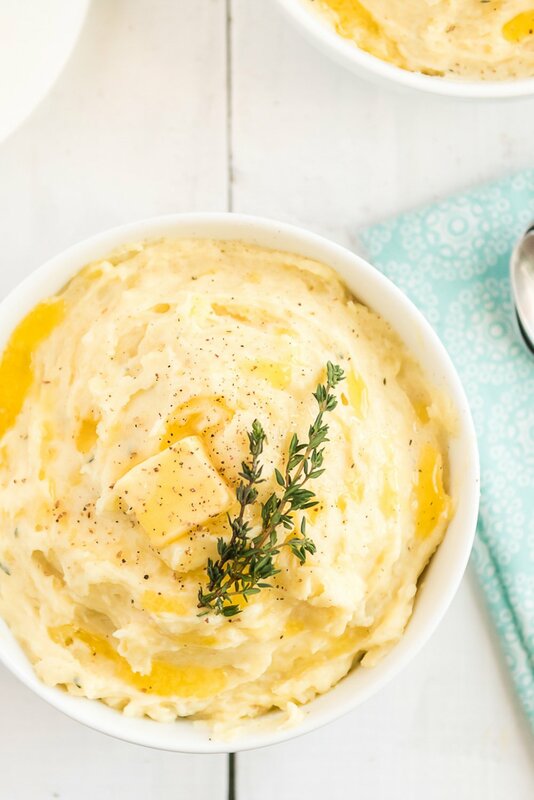 If you want to prep your Homemade Mashed Potatoes well in advance for Easter or Thanksgiving, simply put them in a slow cooker on low and stir occasionally. How Long Are Mashed Potatoes Good For? Refrigerated: 3 to 5 days. 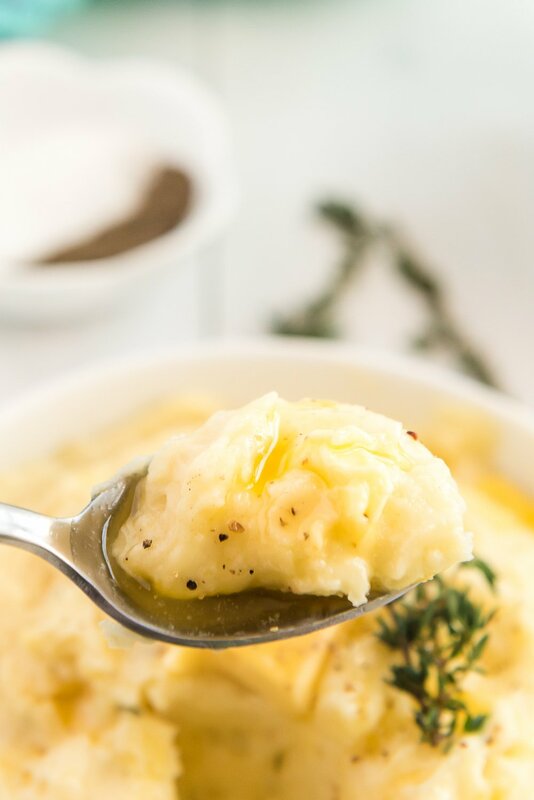 I’ve always been a person who loves a few lumps in my mashed potatoes, but you can use this same recipe with slight adjustments and prep methods. Fluffy Potatoes: In my opinion, Yukon Gold is the best, but for slightly fluffier results, you might want to try a starchier potato like Russets or do a 50/50 blend of the two. Super Smooth Potatoes: Run the potatoes through a ricer, do not add to a blender or food processor, this could result in a gummy texture. Whipped Potatoes: Transfer lightly mashed potato mixture to a stand mixer fitted with a whisk attachment and beat on high for 4 to 5 minutes until whipped and smooth. Potato Ricer For Smooth TextureBuy Now! With Easter just around the corner, save this recipe to serve up with that juicy Maple Ham and be sure to make it again for Thanksgiving and Christmas too! This post was originally published in February 2016 and was updated in March 2019. 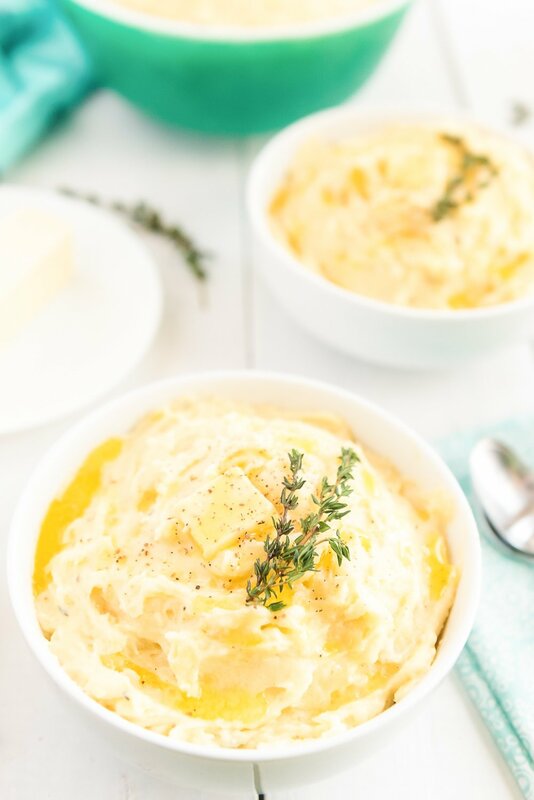 These are The Best Creamy Mashed Potatoes you'll ever make and super easy too! They're loaded with butter, milk, and cream and flavored with garlic and thyme and a touch of salt and pepper! Peel and chop the potatoes into 1-inch pieces and place in a large pot with the garlic cloves. Tie the fresh time sprigs together with thread or bakers twine and add to the pot with the potatoes and garlic. Add the cream and milk and bring the mixture to a boil. Add the salt and reduce the heat to a simmer and stir occasionally until the potatoes are tender and falling apart. Remove from the heat and discard the thyme stems, use a potato masher to mash the potatoes until smooth. Add in the butter and pepper and stir just until melted and combined. Potatoes will have some lumps. If you decide to add additional cream at the end, make sure it is room temperature so it doesn't cool the potatoes down. For super smooth potatoes, run the potatoes through a ricer. 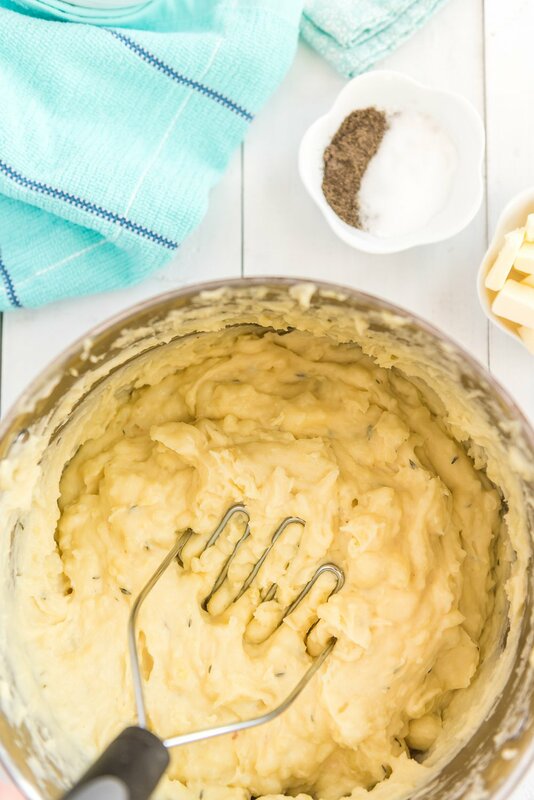 For whipped potatoes, transfer lightly mashed potato mixture to a stand mixer fitted with a whisk attachment and beat on high for 4 to 5 minutes until whipped and smooth. I love your recipes……don’t always have time to make them, and now I’m having back problems, so I hope you have lots of esy receipes. Hi Judy, I definitely have a lot of easy recipes that require minimal prep time, so hopefully, that helps you out!